If you only see one environmental film this year, let it be The Island President. The subject of Jon Shenk’s documentary is recently deposed President Mohamed “Anni” Nasheed and his low-lying island nation, the Maldives. Shenk’s crew had unfettered access to the charismatic leader from the moment he took office as the country’s first democratically elected president through the Copenhagen Climate Summit in 2009. The Maldives is an archipelago of 1,200 to 2,000 (depending on sea level) islands, sandbanks, and coral reefs in the Indian Ocean. 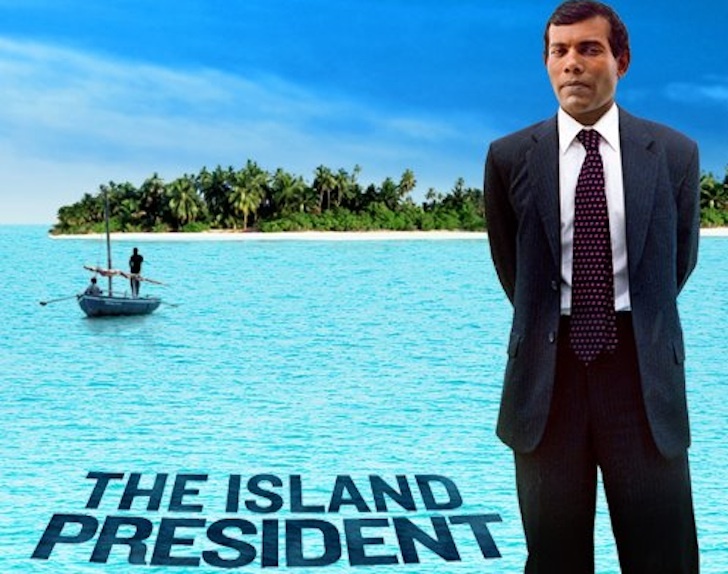 “We do not even have one hill” says Nasheed in the film. No hills and no refuge from the rising tide. 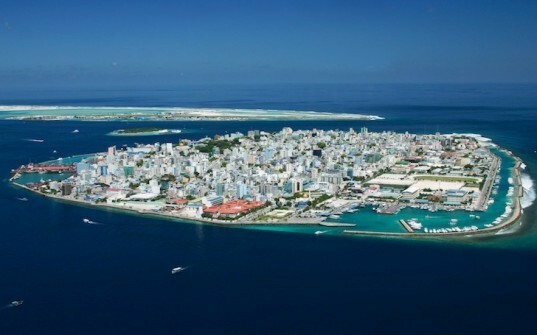 One quarter of the 400,000 people who call the Maldives home live in Male (pictured above). As ocean water warms and land-based ice continues to melt away, sea-level rise threatens to submerge the island nation. A sea-level rise of three feet would drown the entire country and this threat is forcing decision-makers to consider relocating the entire population, or constructing a $2 billion man-made island. In order to save the Maldives and other vulnerable nations, the entire world will need to embrace renewable energy and work much harder to reduce carbon in the atmosphere to 350 parts per million — well below the 393.65 ppm it is recorded at today. As part of Nasheed’s crusade for global awareness and cooperation, he pledged to make the Maldives the first carbon neutral country. While Nasheed has come up against some criticism for his willingness to allow the US-based film crew into his Oval Office (at one point there was talk of live streaming on YouTube), his sense of open collaboration is an integral part of what makes him such an admired leader in his country and abroad. Admired by many–but not all. On February 7th, President Nasheed was forced out of office by Mohamed Waheed Hassan in a coup that many (including Richard Branson) are asking to be resolved by quick and fair elections. Recent political injustice makes The Island President — a film that provides a rare inside perspective on government activity — even more pertinent today. And if the passion and the politics don’t grab you, the stunning time lapse photography, aerial shots, underwater images, and a fourteen song soundtrack by Radiohead might. If you only see one environmental film this year, let it be The Island President. The subject of Jon Shenk's documentary is recently deposed President Mohamed "Anni" Nasheed and his low-lying island nation, the Maldives. Shenk's crew had unfettered access to the charismatic leader from the moment he took office as the country's first democratically elected president through the Copenhagen Climate Summit in 2009.